Seven Sermons of Oscar Romero for Lent - These "sermons" are redactions of various passages from the homilies of Archbishop Oscar Romero, arranged as if they were "commentaries" on the seven Works of Justice and Peace, which is the mission statement of our Catholic Worker house. 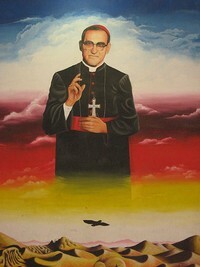 Oscar Romero Ink Drawing by Leo Hart - very large poster of Archbishop Romero with the following quote: "Before an order to kill that a man may give, the law of God must prevail that says: Thou shalt not kill! No soldier is obliged to obey an order against the law of God." "On the Words of Oscar Romero"
The Reluctant Conversion of Oscar Romero, Sojourners Magazine/March-April 2000 - Memories of the archbishop on the 20th anniversary of his assassination - by Carmen Chacon, Salvador Carranza, Juan Macho, Inocencio Alas, Carmen Elena Hernandez, Maria Isabel Figueroa, Jorge Lara-Braud.